This is again the case for another spicy dip, Tortilla Dusted Jalapeno Dip. 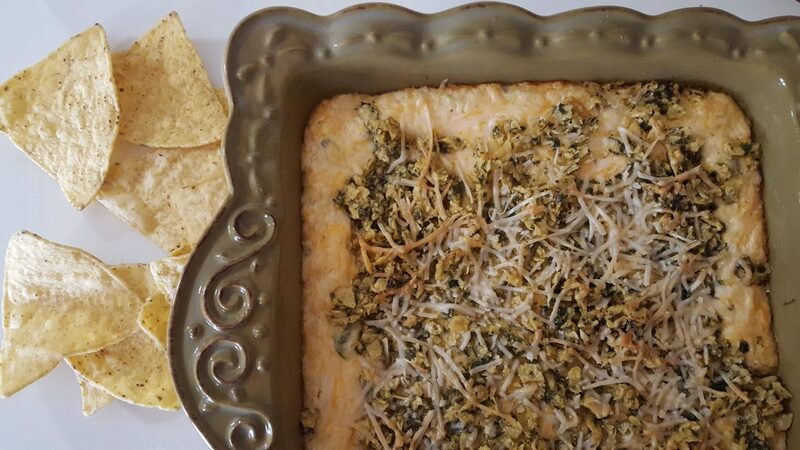 I saw a recipe for Jalapeno Popper Dip in the paper the Saturday before the big event (that would be in 2018). I decided to adapt the recipe and make it spicier. We served it on Super Bowl Sunday 2018 but here it is for you and yours for Super Bowl LIII! Serve with tortilla chips for your next tailgate or other worthy celebration. In a medium bowl, mix the cream cheese, sour cream and sriracha until smooth. Add the cheddar cheese, ¾ of the Parmesan and the diced jalapeños. Mix well. In another medium bowl, mix the crushed tortilla chips, melted butter, remaining Parmesan cheese, pinch of cayenne, and dried cilantro. Spoon the jalapeño mixture into an 8-by-8-inch baking dish or a medium-sized cast-iron pan, spreading evenly. Sprinkle the tortilla topping evenly on top. Bake for 20 minutes, or until hot and the top is golden brown. 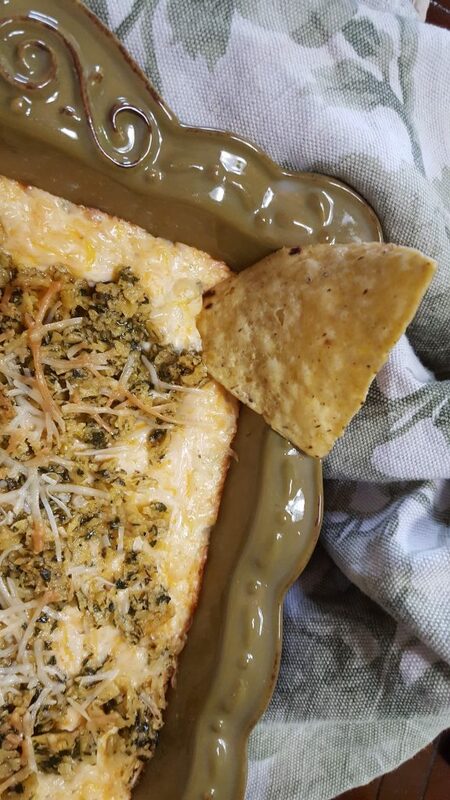 Serve with tortilla chips or crackers. The original recipe called for Italian seasoned bread crumbs. I substituted crushed tortilla chips. I also swapped in dried cilantro for dried parsley that was originally called for. Thank goodness this was a pre-scheduled post a year in advance. February looks to be crazy busy with some work related trips, a lot of meetings and the aforementioned remodeling. Here are a few things to look forward to on EE. Hosting Crazy Rich Asians for Food ‘n Flix. Two TLC Book Tours posts. At least one (fingers crossed) I Heart Cooking Clubs post. This looks incredibly delicious! Enjoy your busy February, Deb. How did you know a whole year in advance that jalapeño popper dip would be every food journalist/blogger’s choice in 2019? I wonder if the BuzzFeed writer was one that just lost their job last week. Ha! So, do you think the feta-herbed-veggie dip I’m making today (to post next Super Bowl) will be the “It” recipe for 2020? So with the tortillas already on top, I could just eat this with a spoon? 🙂 Fabulous dip!!! Love MJ’s idea to eat this with a spoon! And love the addition of sriracha — good idea. Thanks! Here’s the crazy thing. Leftovers are great topped with a fried egg for breakfast.